The MPTS Mux WinApp is a software Multi-Program Transport Stream (MPTS) multiplexer. It uses the same core technology as the Octopus multiplexer, but implemented as an .exe GUI Windows app, rather than Windows service + remote WEB control. The MPTS Mux is a budget-friendly product. Taking SPTS or MPTS streams from encoders / transcoders as inputs, the Multiplexer combines the input streams into the output MPTS stream. Input stream format is TS over UDP. As of the output, the multiplexer can either send it over UDP (streaming mode), or write to a file (offline mode). CPU: 1.5 GHz 1x core is enough for operation. Recommended is 2x core CPU with 1 Ghz speed minimum. Ethernet: 100 Mbps. Recommended dedicated network card for input and dedicated network card for output. A typical application scenario diagram is given below. 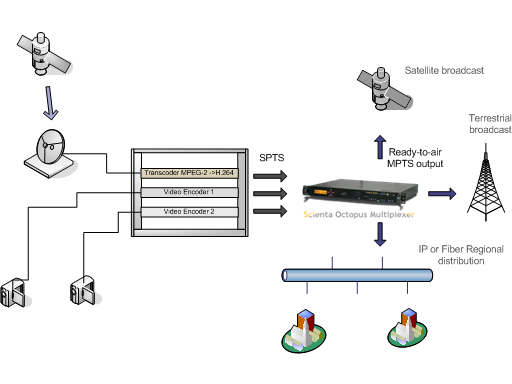 In that appliance, the multiplexer takes multiple sources to distribute the output MPTS into satellite, terrestrial or IPTV broadcast.